Bid For $50 Gift Cards for CARNE CHOPHOUSE in Tampa, Florida! This is a Bid Per Certificate Auction. Bid for the price you are willing to pay for a single certificate. When you win, you may request up to 4 certificates at your winning price. For example, if you win this auction for $10, then you can get up to 4 certificates for $10 each! Bid for $50 Gift Cards to CARNE CHOPHOUSE in Tampa, Florida! Culinary fads have come and gone and Jason Fernandez, a 25 year veteran restaurateur and owner of Carne Chophouse, loves nothing more than a great steak. He’s eaten every cut of meat, prepared in every conceivable style and he remembers every one of them. Jason’s passion for quality ingredients traditionally prepared to allow the true flavor of the food to stand out remains steady no matter what trend comes along. This passion for unfussy excellence gave life to the idea of opening Carne Chophouse; a casual, classic steakhouse. Carne Chophouse is located in the cultural and culinary heart of Tampa, Historic Ybor City. 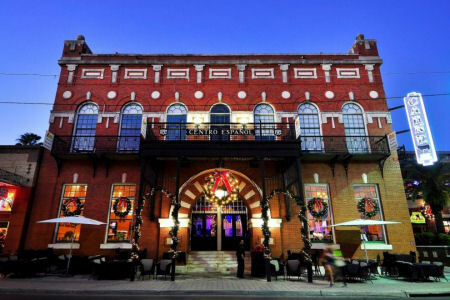 Carne occupies the historic El Centro Espanol Building which once served as the social and cultural hub for Spanish immigrants who worked in Ybor City’s thriving cigar making industry. The main dining area, private dining room, bars and wine cellar occupy the first floor of the building, which was originally used as the cantina. Built in 1912, the architecture is a beautiful combination of French Renaissance Revival, with heavy Spanish and Moorish influences.